To report dietary free sugars consumption and their different types and food sources in European children. The present study is based on the IDEFICS study, a European multicenter cohort study in children (2–9 years old) from eight countries, comprising 8308 children (51.4% males). Dietary intake of the previous 24 h was assessed using a computer-assisted 24-h dietary recalls (24-HDR) and the different types of sugars were assessed using the German food composition database. Mean total energy intake was 1720 (SD 477) kcal/d for boys and 1631 (SD 451) kcal/d for girls. Total sugars intake was 98 (SD 52) g/day for boys and 93 (SD 49) g/day for girls. Free sugars intake was 81 (SD 49) g/day for boys and 77 (SD 47) g/day for girls. Girls had significantly lower intakes of energy, total and free sugars compared with than boys but did not differ in terms of percent of energy from total (23%) or free sugars (18%). There were large variations between countries in average % energy from free sugars (ranging from 13% in Italy to 27% in Germany). Less than 20% of children were within the recommended intake of 10% of energy from free sugars. The food groups that contributed substantially to free sugars intakes were “Fruit juices”, “Soft drinks”, “Dairy” and “Sweets and candies”. 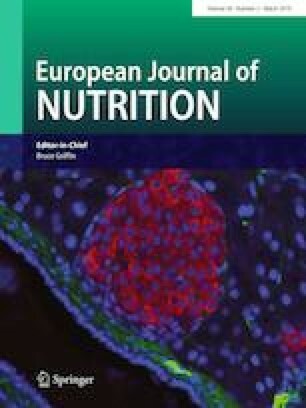 The contribution of free sugars to total energy intake in European children is higher than recommendations. The main food contributors to free sugars intake are sweetened beverages (“Fruit juices” and “Soft drinks”). It is especially important to reduce children’s intake of free sugars, focusing in target population on certain foods and food groups. The online version of this article ( https://doi.org/10.1007/s00394-019-01957-y) contains supplementary material, which is available to authorized users. This study was conducted as part of the IDEFICS study (http://www.idefics.eu). We are grateful for the support provided by school boards, headmasters and communities. We thank the IDEFICS children and their parents for participating in this extensive examination. All authors contributed to conception and design, acquisition of data, analysis or interpretation of data. Each author has seen and approved the contents of the submitted manuscript. Final approval of the version published was given by all authors. This study was supported by the European Commission within the Sixth RTD Framework Programme Contract no. 016181 (FOOD) and by the grant from EU for the IDEFICS study. This analysis was also supported by the Spanish Ministry of Science and Innovation (JCI-2010-07055) with the contribution of the European Regional Development Fund (FEDER). The study is supported by a grant from the Spanish Carlos III Health Institute: RD08/0072/0025 (Red SAMID: Maternal, Child Health and Development Research Network) and CIBEROBN. The funders had no role in study design, data collection and analysis, decision to publish, or preparation of the manuscript. The authors have declared that no competing interests exist. The content of this article reflects only the author’s views and the European Commission is not liable for any use that may be made of the information contained herein.